Load homebrews, updates, psx games and backups, or shutdown, suspend, reboot and restart VSH. Aw man! I always wanted to use this plugin when I had my PSP working and now that it's busted, the plugin works! Nevertheless, good job Plum. Nice to finally see this ported to higher FWs. Plum does it again. Thanks for the new's,cannot wait to try it out. homebrews = Error Code "8001000D"
If there is a letter capital, it has to be capital in the path too! You need the EXACT form of it! With the EXACT form it worked at mine (as you can see in the video). 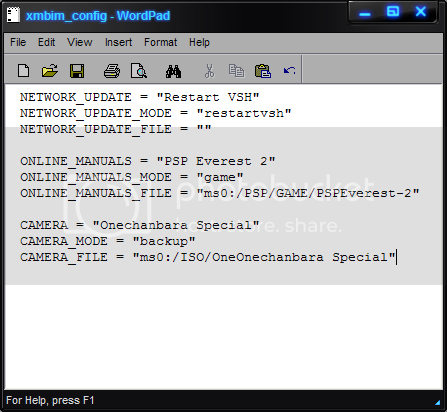 ONLINE_MANUALS = "PSP Everest 2"
SENSME = "King Of Figthers 99"
SENSME_FILE = "ms0:/PSP/GAME/CAT_PSX/King of Fighters '99/EBOOT.PBP"